I'll admit it, I'm a skeptic when it comes to trying various products. Who isn't? We're all looking for ways to get the most out of our money. In this economy, it's best to start pinching your pennies and seek out quality to save money in the long run. and I was impressed by the quality and design on this particular knife. Never have I owned any type of ceramic cutlery so you can imagine my excitement when the knife arrived. My 6" Ceramic Chef's Knife arrived in a gift box surrounded by foam padding to help protect the knife from damage. Please remember that these ShenZhen Ceramic Knives are very sharp and delicate so must be handled with extreme care. As with any knife, keep out of reach of children. Ceramic knives are designed to slice through fruits and vegetables, and other percision tasks with ease. Don't put your steel knives away though, steel knives are still needed for your "heavy duty" cutting. I haven't used my 6" Ceramic Chef's Knife as of yet and cannot tell you how well this product works. However, reviews of these products are outstanding and I am confident that I will be pleased with this knife in the very near future. SHENZHENKNIVES.COM MISSION: As the leading online retailer of ceramic knives and ceramic knife sets, our goal is to provide affordable ceramic knives to our customers. We offer a variety of ceramic knives and ceramic knife sets to meet all of the slicing needs of the amateur chef. MAKING CERAMIC KNIVES: Ceramic knives are made out of zirconium oxide. The ceramic blade undergoes high-pressure molding before being fired. Then the ceramic blade is then ground and polished on a diamond wheel to form the ceramic blade's edge and attached to the knife handle -- giving a very hard edge that rarely needs sharpening. CERAMIC BLADE TECHNOLOGY: Ceramic blades will not rust. Their chemical inertness to both acids and alkalis and their ability to retain a cutting edge far longer than forged metal knives makes them a very good culinary tool for slicing and cutting through boneless meat, vegetables and fruits. 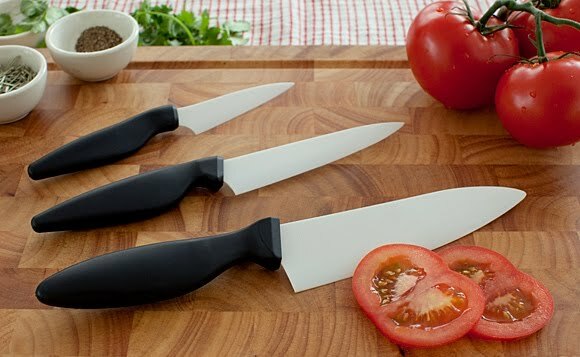 Since ceramic knives are very rigid they cannot be used for chopping, cutting bones or frozen foods or prying open things, which may cause the cutting edge to chip off or the blade to break free from the handle. The tips of these ceramic knives are resistant to rolling and pitting but may break when dropped to the ground. You can purchase your very own Ceramic Knife products directly from ShenZhen Ceramic Knives or through Amazon . A coupon code has been provided for you below when making your purchase through ShenZhen Ceramic Knives! 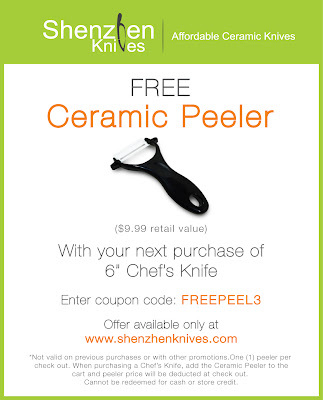 One winner will have the opportunity to win a 6' Ceramic Chef's Knife from ShenZhen Ceramic Knives. MANDATORY ENTRY: Visit ShenZhen Ceramic Knives and let me know what other products you like. *What food are you going to try your new knife on first? *Have you ever owned a Ceramic Chef's Knife? DISCLAIMER:I received a sample from ShenZhen Ceramic Knives to share the products with my readers. However, I have posted my own unbiased opinions on these products. All opinions are strictly my own and true. I like the paring knife. I would try this knife on cutting some veggies. I've never owned a ceramic chef's knife before. I would definitely use that paring knife! I would love to the Shenzhen's 3-pc Chef's ceramic knife set. If I won, I would use the Shenzhen ceramic knife to cut vegetables for huge platter that I have to make for a party. i like the ceramic peeler too. I've try slicing an apple first. Never owned a ceramic knife but I've wanted to. I like the ceramic peeler. i would use this on a big steak! Their 2 piece set + the vegetable peeler looks very nice. I like the paring knife. THANKS for the AWESOME GIVEAWAY!!! I would try cutting fruit first. I would love to have the 3.2" Ceramic Paring Knife. We would like the three piece chef's set. I've never owned a Ceramic Chef's Knife before, but I'd love to try one. I liked the 2-piece Fruit & Vegetable Set (Paring & Slicing Knife + Ceramic Peeler). I like the vegetable and fruit peeler. I never owned a chef knife. This is an awesome giveaway. I really like the Ceramic Peeler! I would like to try this Knife on some tomatoes to see how well it does! No, unfortunately I've never owned a ceramic knife before. I'm now a follower on Google Friend Connect! If I won this item I would use it mostly on onions because the sharpness of a knife helps the 'crying' to go away. No I have never owned one of these knife's before but I would love to own one because I am a chef at a restaurant and going to be going to a culinary arts school soon. I follow you on Google friend connect!!! I love the chef set...and the peeler. Awesome! I think I'd try cutting beef for szechuan first. Yum! I like the 2 pc Starter Set. I'd like to try the ceramic knife on tomatoes. I would also like the ceramic peeler. The 2-piece Fruit & Vegetable Set (Paring & Slicing Knife + Ceramic Peeler) looks great! Like what my husband does, I'll try slicing a piece of paper with the knife. I like the Shenzhen 2-piece starter set. I'd love to have the 2-piece Fruit & Vegetable Set (Paring & Slicing Knife + Ceramic Peeler). I like the 2 piece starter set. I'd use it to cut veggies nice and small! I've never owned a ceramic knife. I like the 4.8" Ceramic Slicing Knife. I would love to try a ceramic knife. I have never owned a Ceramic Chef's Knife, but I certainly want to. I could really use the 2 Piece Fruit & Vegetable Set w/ Peeler! The paring knife is what I would love. I go through these and would love a good quality one. I like the 2 piece everyday set as well. I would use it to peel potatoes, I hate peeling potatoes with a dull knife. Yes, I own a ceramic knife and love it. I've never owned a Ceramic Chef's Knife, but I'd love to try one. I like the 3.2" Ceramic Paring Knife. I would like to chop [e[[ers or onions first. I use them a lot in cooking. I've never tried a ceramic knife. Rss subscriber via Google Friend Connect. I also like the ceramic peeler. I'd try it on potatoes first. I've been dying to try out a cermaic knife because I never have. I like the Ceramic Peeler! I would like to try the 3.2 in. paring knife. i would try the knife on some fruit first! I would like the 2 piece fruit & vegetable set w/peeler. I would try slicing some tomatoes for salad first. No, but I am really expecting to own one soon--if I don't win, will buy! I would love to try the two piece everyday set! I have never owned a ceramic knife but hope to soon! I would try a new knife on a tomato first thing! I also like the 4.8" Ceramic Slicing Knife. I would try it out first on a head of lettuce. No, I have never owned a ceramic knife before. I think I'd try it first on cutting veggies for stir fry. I've never owned any ceramic knives, and I'm curious to see how they work. I would use it to cut veggies for stew. I have never owned one but have looked at then many times. The 2 piece Fruit & Vegetable set would be great. I like the Ceramic Peeler. it looks as though it would not rust easily. I am very curious about the qualities of a ceramic blade! I like the 2-piece Fruit & Vegetable Set. Thanks for the giveaway...would like to try out a 3.2" Ceramic Paring Knife ! ...would like to start off doing some prep work i.e. chopping veggies ! ...I have no experience using ceramic knives. I like the 2-piece Starter Set (Chef's & Paring). The first thing I would use my new knife for is slicing ham. I've never owned a Ceramic Chef's Knife. I've never owned one before. I also like the 2-piece Fruit & Vegetable Set (Paring & Slicing Knife + Ceramic Peeler).